Turi Beach Resort Batam is one of the most well-known and established resorts in Batam. It’s a world-class 4-star beach resort that is both excellent and affordable at the same time. Our basic 2D1N Turi Beach Resort Batam package consists of a 2-way ferry tickets from Singapore, 1 night stay with breakfast, and 2-way Batam land transfers. You have the option to upgrade to a 2-days-1-night Turi Beach Resort Batam tour package that also includes a city tour with seafood lunch and 60-min body massage. Located in the Nongsa area and 40-min car ride away from the city centre, Turi beach resort is all about tranquillity and away from the hustle and bustle of modern life. For an even more exclusive resort in the Nongsa area, you might want to consider the luxurious Montigo Resorts Batam that provides private-pool villas. For a slightly lower price point, consider its neighbouring resort next door, Nongsa Point Marina Resort Batam. Batam Turi Beach Resort is suitable for leisure travellers who want to enjoy nature at its best through its private beach and lush greenery. To get the most out of your experience in Indonesia, prepare yourself in the best possible way. One way is to go for a Bahasa Indonesia course in Singapore at Learn Indonesian Hub. This one-of-a-kind Batam beach resort has everything from meeting facilities, restaurants, bars, spa, water sports, swimming pool, huge bedrooms, and of course a private beach! 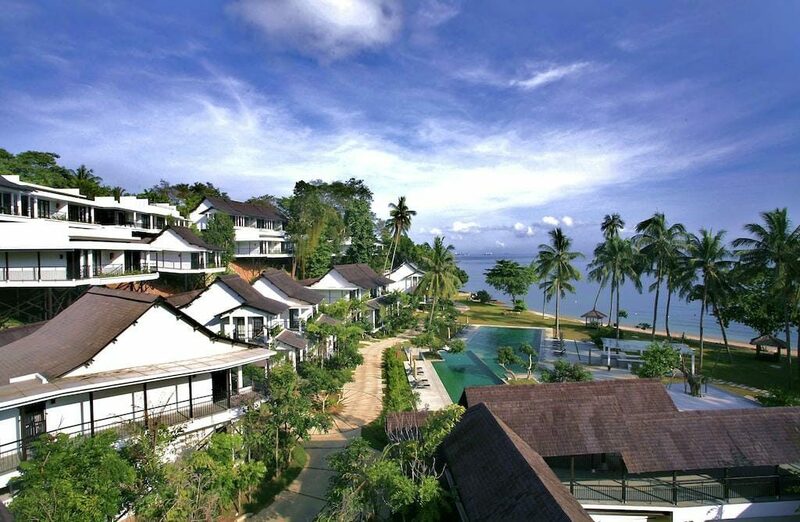 If you’re looking to a compare with a similar resort in Bintan, you could consider the famous Bintan Lagoon Resort on our sister site BintanGetaway.com. Of course, you should also check out the hottest and most unique ‘glamping’-style (glamorous camping) resort, The Canopi Bintan. Turi Beach Resort’s weekend rate is significantly higher than its weekday rate, so try going on a weekday to save some dollars and also to beat the crowd. The resort also imposes additional surcharges on certain peak / public holiday dates. Whether you’re looking at a Batam beach Resort package with ferry and tour, or just a resort with ferry package, rest assured that we offer the most competitive batam packages here in Singapore. I’m glad i change my stay instead of peak period. Wonderful experience, love their private beach and activities. Much better than other resorts. Good price. Thank you batamgetaway team! I stay here 3 times now already. Good experience as usual. But public holiday really very crowded the whole batam. This resort also. Still will come back agian soon. Thanks batamgetaway for the arragenemtn! Best resort in batam, that’s all. Service was really lacking. Apart from that, good beach, facilities, and atmosphere. We like everything except for the service, which was a real turn off for a resort stay. Thank you batamgetaway for the great service and price! My perfect getaway with loved ones. We totally enjoyed ourselves. We are looking at Montigo for our next batam trip, see you! Went there for a getaway with my hubby. We got the Riani Deluxe Room. Rooms are huge with high ceiling, the swimming pool at Riani wing is much smaller than the Premier wing. Hotel staff spoke good english as well. We also arrange for a private candlelight dinner by the beach, it was worth while even though food portion can be improved. 1 of the better beach resorts in Batam. stayed several times at different resorts but Turi Beach Resort is still the best. Modern rooms accompanied by good service by hotel staff. It’s always a joy to stay here. Celebrated our belated honeymoon at Turi Beach over the last weekend. We thoroughly enjoyed our stay. Was surprised that the resort provided us with a complimentary room upgrade. Beach is clean and swimming pool is a good place to relax and enjoy the sun! Rooms are very spacious, good for families. My favourite in batam. trust me i stay in many hotels and resorts in batam. And prices on batamgetaway is cheapest. thank you! A really good resort i must say. I have stayed in plenty of resorts all over the world every year and this resort can really match some of the top resorts, especially in terms of ambience, and scenery. But what it lacks is the privacy and exclusivity. We went during a peak period and there were really tons of people around. Not something i’m used to. still recommended. Thanks batamgetaway. I stayed during Sunday to avoid the weekend surcharge here and definitely enjoyed my stay here as the crowd is much less as compared to Friday or Sat. We chose the Tirtra Beachfront rooms are it exceeded our expectations as we have good sea views and breezy winds during the evening! I really enjoyed staying here for 2 nights with my daughter. We enjoyed the nature in this hotel. We’ve seen some monkeys and squirrel on top of our roof top in the morning. This hotel is clean, comfortable and the hotel staff are friendly. We came during weekdays so it’s quiet and peaceful. I found that this hotel is very relaxing. We love the private beach, the swimming pool as well as playing segway to go around Nongsa from the Cabana Club which belong to the hotel. The only downside is the food taste in the Taming Sari Cafe doesn’t suit our taste. But overall we have a great time in here. Thanks Batamgetaway !! Turi is always my choice for a beach getaway to Batam. Despite the drop in standards for their buffet breakfast, I must say that the services of the staff, hotel rooms and pool is truly a stress-free getaway from Singapore.